Here at ChiIL Mama and ChiIL Live Shows we've adored Gene Weygandt's work since long before we had the chance to catch him for a video interview during his stint as Jean Shepherd in “A Christmas Story, The Musical.”at Chicago Theatre. We can't wait to see his take on “Uncle Philip’s Coat” for Solo Celebration! at Greenhouse. 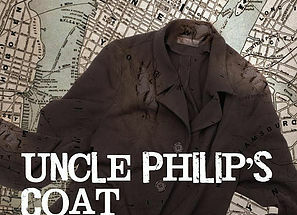 The Chicago Premiere of playwright Matty Selman’s “Uncle Philip’s Coat” will run at the Greenhouse Theater Center (2257 N. Lincoln Ave) Nov. 27 – Dec. 31. Directed by Elizabeth Margolius and starring Gene Weygandt (best known as The Wonderful Wizard of Oz in “Wicked” in Chicago and on Broadway), “Uncle Philip’s Coat” follows Matty on his humorous and heartfelt journey of personal discovery, sparked by his inheritance of a tattered coat from his eccentric Russian-Jewish immigrant uncle Philip. The press opening will be on Friday, December 2 at 7:30 p.m. When Matty, an unemployed actor, is given an old, decrepit coat from his recently deceased great-uncle Philip, he is unsure whether he has been given an heirloom or a heap of rags. Through his attempts to find the answer, he travels across time, territories and tragedies in an effort to uncover the history of an unfaltering dreamer. “Uncle Philip’s Coat” poses larger questions of family, mythology and the inheritance of a Jewish son. How did a man who made it to the land of opportunity become a homeless wanderer, and what can he teach us about the stories that we tell to surround ourselves and keep away the cold? The performance schedule for “Uncle Philip’s Coat” is as follows: Wednesday – Saturdays at 8 p.m. and Saturdays and Sundays at 2:30 p.m. Previews begin Nov. 27, and the opening night is Friday, December 2 at 7:30 p.m. Performances continue through Dec. 31. The press opening will be on Friday, December 2 at 7:30 p.m.
Flex passes to the Solo Celebration! series, which offers admissions to three plays for $99 or five plays for $164, are now on sale. Preview tickets are $34. Single tickets range in price from $42 – 48. Flex passes and tickets can be purchased by contacting the box office at 773-404-7336 or by visiting greenhousetheater.org. Gene Weygandt is one of Chicago’s most acclaimed actors, perhaps best known for his portrayal of The Wonderful Wizard of Oz in “Wicked” in Chicago, and on Broadway. He also starred as Jean Shepherd in “A Christmas Story, The Musical.” Also on Broadway, Weygandt originated the role of Paul in “Big: The Musical.” He is a three-time Jeff Award recipient for “A Day in Hollywood/A Night in The Ukraine,” and “Me and My Girl” at The Marriott Theatre, and for “Little Shop of Horrors.” He received an After Dark Award for his role as Max in the long-running hit, “Lend Me a Tenor” at The Royal George Theatre. Other credits include “Inspecting Carol” at Steppenwolf Theatre Company, “The Taming of the Shrew” at Chicago Shakespeare Theater, and principal roles in “Old Jews Telling Jokes,” “The Miser,” “Arthur: the Musical,” “The Light In The Piazza,” “Hairspray,” “The Music Man,” Don’t Dress for Dinner,” “Little Me,” and “The Man Who Came To Dinner.” Weygandt’s TV and film credits include “The Birdcage,” “The Babe,” and “The Pager,” “Chicago Fire,” “Betrayal,” “Boss,” “Mind Games,” “The Beast,” “Home Improvement,” “Cybill,” “Murphy Brown,” “Drew Carey” and more. Elizabeth Margolius has worked with theaters and universities in various capacities throughout the country, including the Santa Fe Opera, Florida Studio Theatre, the Virginia Shakespeare Festival, New York’s Encompass New Opera Theatre, Millikin University, the University of Northern Iowa, and the University of Nebraska. In 2015, Margolius was invited back to her alma mater, Converse School of Music in Spartanburg, SC, to direct the world premiere of a new opera/oratorio, “Troiades.” Her Chicago directorial credits include “Sitayana” (Gift Theatre's TEN Festival), “L'Occasione Fa Il Ladro (A Thief by Chance)” and “Twelfth Night” (DePaul Opera Theatre), “The Girl in the Train,” “The Land of Smiles” and “The Cousin from Nowhere” (Chicago Folks Operetta), “Goldstar, Ohio” (American Theater Company), “The Ballad of Baby Doe” (North Park University), “The Merry Wives of Windsor” (Chicago Shakespeare Theater; Assistant Director to Barbara Gaines), “The Mikado” (Savoyaires), “The Last Cyclist” (Genesis Theatrical Productions), “Death Takes a Holiday” for Circle Theatre and “Opus 1861” (City Lit Theater; nominated for three Joseph Jefferson Awards) “Violet” (Bailiwick Chicago; nominated for five Joseph Jefferson Awards), “Broadway Sings the Silk Road” (Silk Road Theatre Project) and “Bernarda Alba” and “Songs for a New World” (Bohemian Theatre Ensemble). Margolius has also directed works at Harper College, Theatre Building Chicago/New Musical Development, Theatre on the Lake, Stage Left Theatre, Live Bait Theater and the Center for Cultural Interchange. Margolius is an alumna of the 2004 and 2005 Lincoln Center Theater Directors Lab in New York, a 2007 recipient of a full directorial scholarship at the Wesley Balk Opera-Music Theater Institute in Minneapolis, a 2009 respondent and workshop artist for the Kennedy Center’s American College Theatre Festival, and a 2010 finalist for the Charles Abbott Fellowship. She is the Co-Founder and Artistic Director of DirectorsLabChicago, a forum for emerging nationally and internationally based stage directors. Matty Selman is the author of “Uncle Philip’s Coat,” a Herbert Berghof Memorial Play, which is included in the permanent collection of the National Foundation for Jewish Culture. Selman has written three musicals in collaboration with “Agnes of God” playwright John Pielmeier, including “Young Rube” (music and lyrics) “Steeplechase The Funny Place” (music and lyrics) and “Slow Dance with a Hot Pickup” (music and lyrics). Selman was selected by A.R.T. Founder and Artistic Director, Robert Brustein, to write the lyrics for “Lysistrata,” with music by “HAIR” composer, Galt MacDermot, and starring Tony Award winner Cherry Jones. “Lysistrata” was a co-production of A.R.T. in Cambridge, MA and The Prince Music Theatre, Philadelphia, PA. Galt and Selman then wrote “Goddess Wheel” developed at CAP21 (Collaborative Arts Project 21) and currently, “The Tinderbox,” which had its premiere performance at Carnegie Hall’s Weil Hall. Selman’s Irish musical, “Parcel From America,” was produced in at the Oregon Cabaret Theatre in Ashland, Oregon. Selman received the Emmy Award for writing and producing the theme and incidental music for “Martha Stewart Living” on CBS and “B. Smith with Style.” Other awards include a playwriting grant from BACA (Brooklyn Arts and Cultural Association). Selman is a writer/publisher member of ASCAP, a member of the Dramatists Guild and serves on the Board of Directors/Script Selection Committee for the New Harmony Project, a not-for-profit organization that supports writers whose work explores the journey of the human spirit. “Uncle Philip’s Coat” is one of 12 plays featured in Greenhouse’s “Solo Celebration!,” which includes ten full productions, two limited engagements and other special events running June 2016 through February 2017. Among the other directors connected to solo series are Goodman Theatre Producer and Artistic Collective Member Steve Scott, Writer’s Theatre Resident Director Kimberly Senior, Directors Lab Chicago Artistic Director Elizabeth Margolius and Remy Bumppo Artistic Associate Linda Gillum. Some of the performers confirmed to star in solo works include Jeff Award-winners Kate Buddeke, Gene Weygandt, Linda Reiter acclaimed British actor Simon Slater, Will Allan and Carin Silkaitis. Most productions will be produced in their entirety by Greenhouse, while other plays will be stated with co-producers including Sideshow Theatre Company and The Other Theatre Company. Greenhouse’s “Solo Celebration!” is co-produced by Forum Productions and underwritten by the Wendy and William Spatz Charitable Foundation.